What could be more fun than a party where you get to make your own favors to take home? Host a kid-friendly, crafty get-together for your child’s next birthday party or special occasion, and create anything from scrapbook masterpieces to vibrant tie-dye fashions. The guests will love showing off their artistic skills, and you will love how easy it is to keep a bunch of energetic kids entertained. This one can get a bit messy, so we recommend you host it outside or in a garage lined with a tarp or plastic drop cloth. 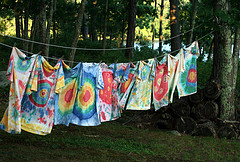 Ask the guests to come in old clothes they can get dirty in and have them each bring a white cotton item of clothing to tie-dye (T-shirts and tank tops work well, but you can also try socks, headbands or dresses). Buy a variety of colored fabric dyes from the craft store, and let the kids get messy experimenting with different colors and patterns. For more details, check out this groovy . This is a fun project for boys and girls alike, plus it’s a fantastic way to recycle plastic containers. Collect a bunch of different plastic bottles, tubs and other miscellaneous containers; wash and dry them well. Have each guest select a container and glue aluminum foil around the outside. Decorate with sparkly pipe cleaners, googly eyes, sequins, glitter, pom-poms or other fun accessories. Each robot will look different and out-of-this-world! Beading is a simple and inexpensive craft, so it’s great for large groups of kids. Buy a variety of colorful beads of different sizes, along with wire or string and needles (for older children). The party guests can make as many necklaces, keychains, bracelets and other creations they like until the beads run out. Have you ever hosted a crafty party? Do you have any helpful tips to share?